Nearly a quarter of the South African flora is considered either threatened with extinction or of conservation concern. The total number of plant taxa listed nationally in each Red List category. 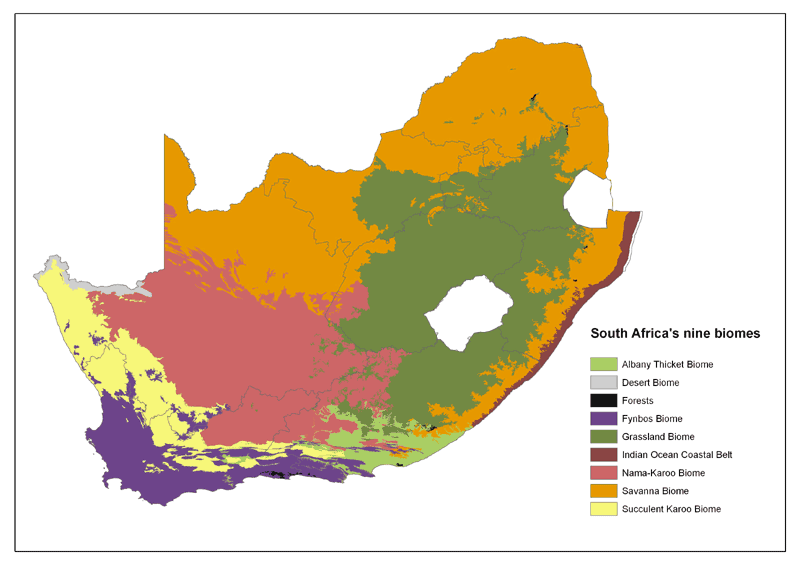 Major threats to the South African flora are identified in terms of the number of plant taxa Red-Listed as threatened with extinction as a result of each threat. Habitat loss, which includes the irreversible conversion of natural vegetation for infrastructure development, urban expansion, crop cultivation, timber plantations and mines is by far the most severe threat to South African plants, affecting more than 1600 taxa. Invasive alien plant species outcompeting indigenous plant species is another severe threat. Habitat degradation includes threats such as overgrazing, inappropriate fire management (which may be either too frequent, too infrequent or out of season fires) and clearing of woody shrubs and trees from forests and savannas. These threats may appear to leave natural vegetation intact, but causes a disturbance and breakdown of essential ecosystem processes, resulting in the loss of sensitive species. Harvesting is the unsustainable, destructive removal of plants and plant material such as tree bark for local and international trade (medicinal as well as ornamental) as well as for materials for construction and crafts. Demographic factors include species that are threatened as a result of high risk population dynamics such as small population size, poor breeding success, and skewed male-female ratios. Pollution indicates species that are threatened by water, land or air pollution, typically species affected by harmful industrial and agricultural chemicals such as fertilizer, pesticides and herbicides. Changes in species dynamics indicate species that are threatened as a result of disturbances of the natural interactions of native species such as the loss of pollinators or dispersers. Often severe habitat disturbance may give a few native species a competitive advantage, and they then act in the same way as alien invasive plants, outcompeting and replacing other sensitive native species. Climate change has been identified as a threat to only a small number of plants, particularly because the potential impact of climate change on different species is not well understood and not easy to predict. Natural disasters include threats such as droughts and floods. Where do most species of conservation concern occur? 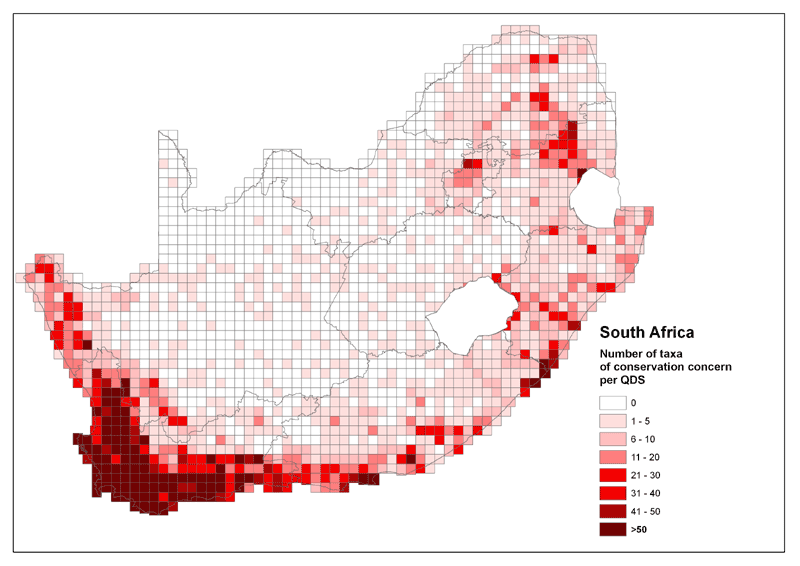 A map of South Africa, showing areas of high concentrations of taxa of conservation concern. SANBI. 2017. Statistics: Red List of South African Plants version 2017.1. Downloaded from Redlist.sanbi.org on 2019/04/26.